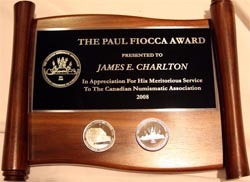 The Paul Fiocca Award is the highest distinction presented by The Royal Canadian Numismatic Association, and the second highest award in Canadian Numismatics. The award is presented annually for “Long term meritorious service or major contributions to the RCNA” and is an award not just to recognize the elite of the hobby, but any individual who may have worked behind the scenes, often for many decades, for the betterment of the Association. This award is strictly an RCNA award for RCNA members, and is not to be confused with the J. Douglas Ferguson award, the highest award in Canadian numismatics, which does not require membership in the RCNA. Paul Fiocca was publisher of Canadian Coin News from 1989 until his retirement, remaining a supporter of Canadian numismatics and giving freely of his own time and expertise. He served as editor of The CN Journalfor a number of years, and was serving the RCNA in that capacity at the time of his death in 2007. The award that bears his name is funded by donations from Trajan Publishing Corporation and others that were his friends. The President of the Association presents the Paul Fiocca Award at each year’s annual RCNA convention to a Royal Canadian Numismatic Association (RCNA) member. An Independent Board of Award selects the annual recipient. The Board consists of five members. 1. The current RCNA President. 2. A senior Executive of Trajan Publishing Corporation. 3-5. Three other senior RCNA members appointed by the RCNA President and Trajan Publishing Corporation, at least one who is a past RCNA President. The board selects a chairman each year and calls for nominations. Nominations are welcomed from any member of the RCNA The award is given exclusively to a living RCNA member who had not previously received the award. The award consists of a walnut plaque with a gold plated inscription and with two current year RCNA Convention medals imbedded, and a separate framed Certificate of Award listing the accomplishments of the recipient.